In a blog post published on the 3rd May, Google has announced that it has rolled out HTTPS for all BlogSpot, even for those having a private domain. Launched in September last year, this feature was an option which users could turn on. But now the feature is set by default. Another option has been added, one that says "HTTPS Redirect". If this feature is turned on, automatically all visitors will be redirected to the HTTPS URL instead of the old insecure HTTP link. 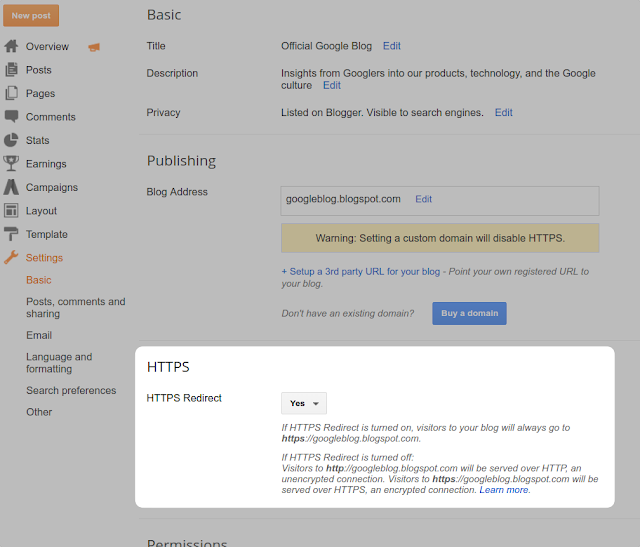 Google also stated that mixed content may cause some of the blog's functionality no to work with the HTTPS version. This is usually caused by incompatible templates, gadgets, or post contents and they are working on these issues but there are some setting that blog owners only will be able to do so that these works.